Totally jealous of you garden by the way. Gorgeous! What a charming foyer. 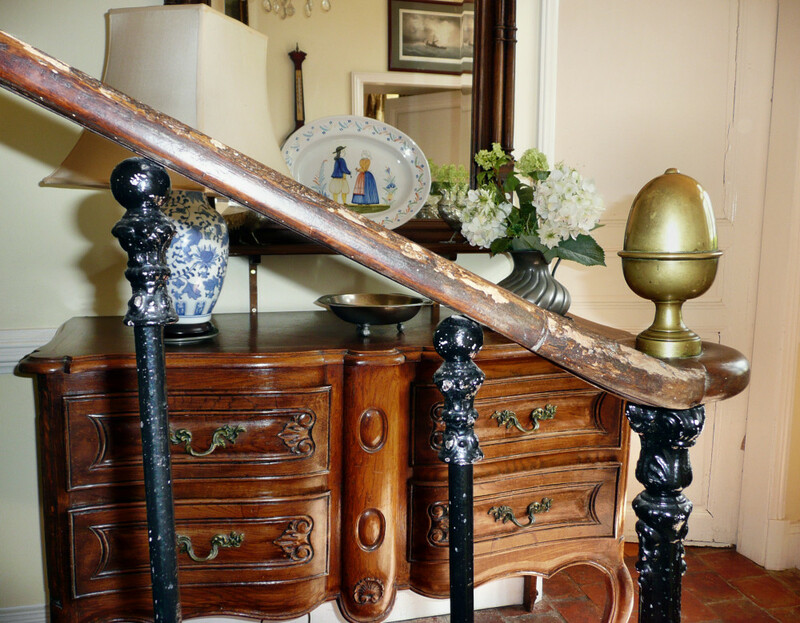 I love the patina on the staircase and all your lovely French pieces. The view is magnificent. 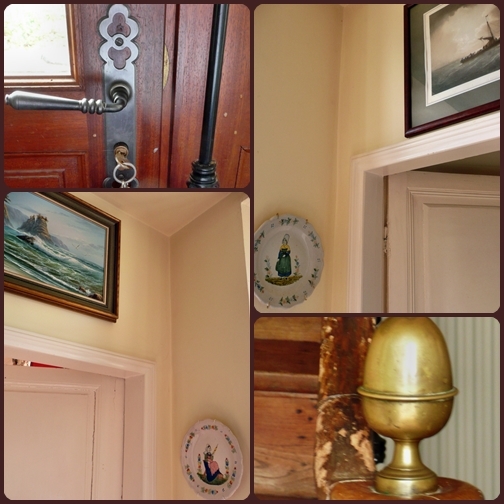 I decorate with a lot of French pieces and am really into French Country. Would love to visit Normandy! That was a lovely tour! I like to change things round with the seasons, and enjoyed reading how you do the same. Maggie, this really is lovely and very welcoming! I know you're in France, but some of the feautures, such as the pretty painted radiator cover and the glass doors and the beautiful garden remind me of the house we stayed in when we visited England 11 years ago. I do love your house!! Thanks for sharing. Maggie, you had me at the front door. What a gorgeous entrance! 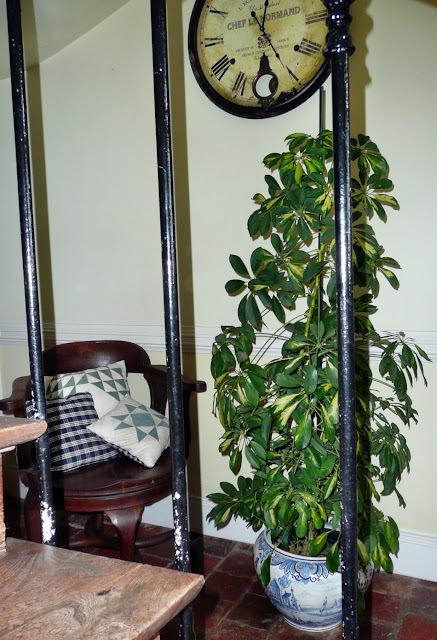 Then I fell in love with your banister and the brass finial. What a treat to see a home from Normandy at my little party. Thank you so much for sharing this with us! What a beautiful entryway and a charming historic home! How lucky you are. The architectural details and the stairwell are fantastic! Maggie, it is as lovely as I imagined! Was hoping to visit this fall but plans have changed, maybe next year! What fun, I think Ricki Jill is participating in this as well. I have already shared some of our rooms as part of sharing our renovation project, so do not think it will be appropriate to join in. Maggie your home and garden look wonderful, thanks for sharing. Goodness, what a welcoming but elegant feel your hall has! The view out the doors is stunning! Oh my goodness! This is my first time to land at your blog and I love it. Your home is unbelievably pretty. You are living the dream there. Maggie -- you have a great hall -- I envy it!!! Love everything about it. It is so welcoming and to think, I was so close in April! What a beautiful foyer; I'm drooling, lol! Now this is what I call a gorgeous hall..what an amazing view out to your front garden. 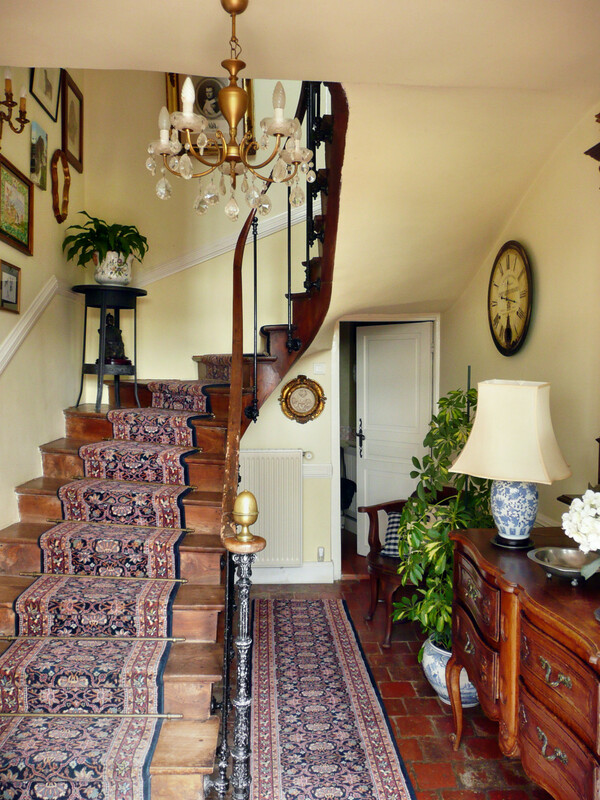 Love the staircase and your lovely French furniture pieces. If this is the entry to your home, oh my, what the rest must be. So elegant and beautiful. Dear Maggie! Thank you for stopping by and your sweet comments on my quilts! Your hall is to die for! I would be so happy just hanging out on the stairs, taking everything in! Please keep in touch - have made many new friends through Bunny Jean's Bunny Hop! Hope you'll come back again, often! I have become your newest follower. So glad I found you. I am going to put you on my blog roll. I am following too. I would so love to live in France. We have just been offered a house swap for 2 months next year. Now I just have to convince Mr Beach House to come with me. I will watch your blog with great interest. And by the way your entrance hall is supurb. And your garden well it's just dreamy. Your hall is so lovely... very welcoming and a sneak peak of what is to come in the rest of the house. I can't wait to see the rest of the rooms! All I c an say is that I am drooling over your lovely photos of your home! A visit to Normandy is on my 'bucket list' of things to do. My husband is a WWII buff and we would love to visit all the well known historic locations. A beautiful part of the world for sure. Maggie, it's so lovely of you to share with us a glimpse into your lovely home. the front hall is so filled with wonderful things. 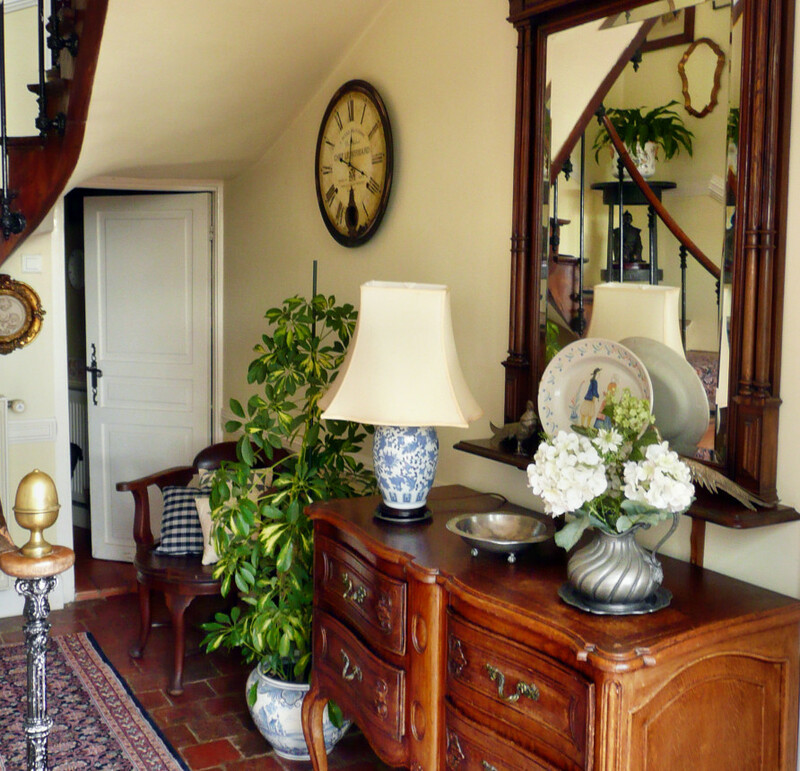 I like the light of the foyer - room by room will be a nice thing to look forward to. Maggie, I loved the tour of your hall. It is so lovely. I love your traditional home. The clock is so near and I especially love the captain's chair. Thank you for sharing this space with us. Your entry and stairs are very nice, but the showstopper is that beautiful backyard! I also just became a follower. Thank you for your lovely comments on my blog. 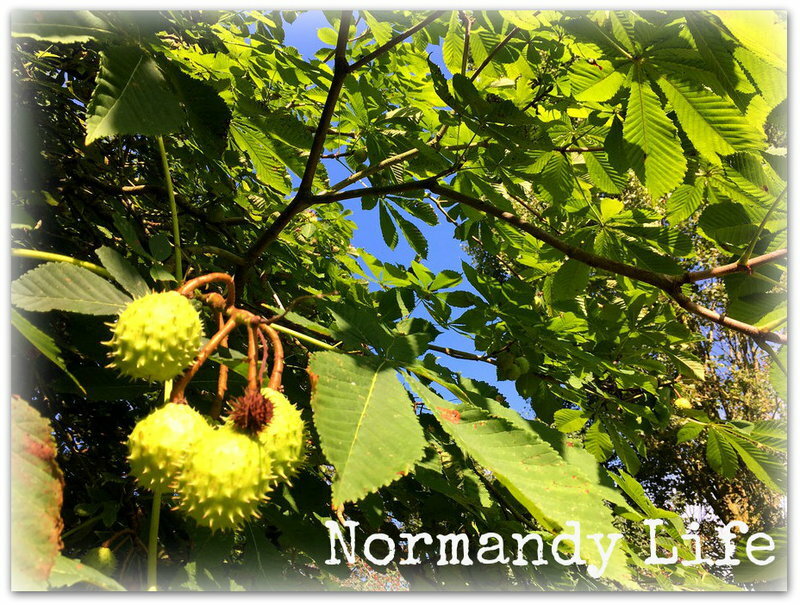 Your life in Normandy looks delicious. Your abode is very inviting and warm, I love your photos! Oh, I know I'm going to love this! Those doors are heavenly. I'd love to knock and see you walking along the hall to open them up. Maggie, hello dear, I loved the tour with you of your beautiful Normandy Home. How lovely, everything I would expect from you. Your furniture and collections are so welcoming in "the hall". Your Pewter pieces are beautiful and you know how I love your French Faience Quimper! 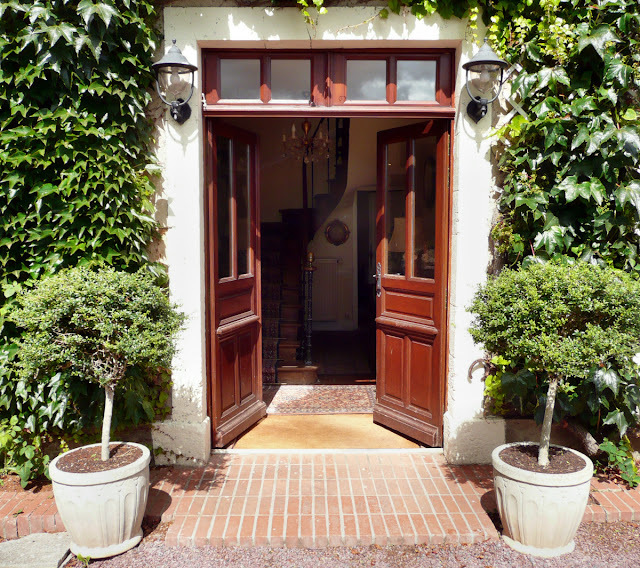 Those double entrance doors make such a grand entrance and of course those lovely French Gardens. I so enjoyed my visit Maggie. I'm just coming from your entry hall "before" post...and of course I just had to come and see the end result! Ohhh my goodness, what a miraculous transformation! I can't even begin to imagine the work or the patience that your home remodel required. It certainly was worth it! I know...I know...easy for me to say, right? Hehe! Seriously though, your entry hall really is beautiful! It certainly does speak to "the beauty" which is to follow through the rest of your home! I don't have an entry hall...so I'm quite green with envy, my friend! I love everything about yours...the gorgeous brick tile floors...that swirling staircase...and your beautiful furniture! It's all perfect! 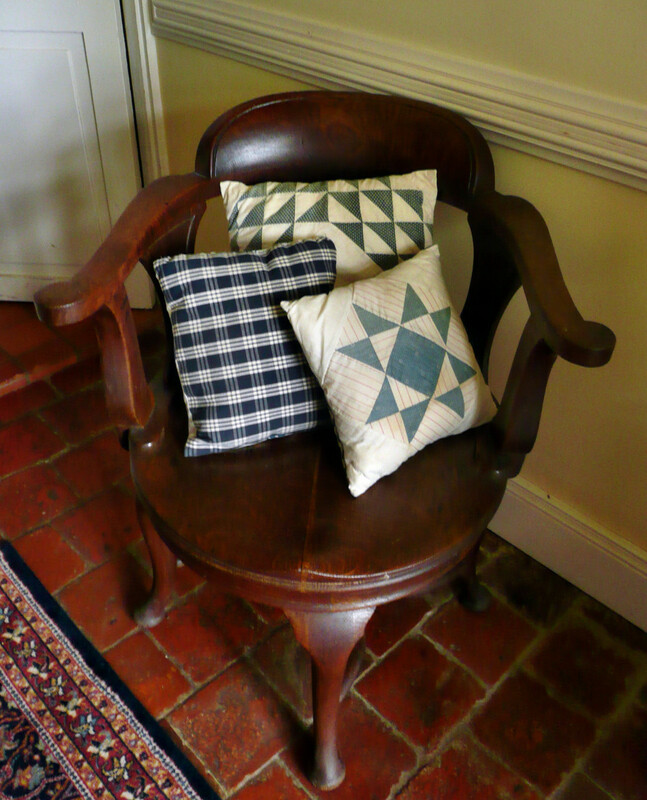 Thank you so much for sharing your lovely home with us...this was such a treat! 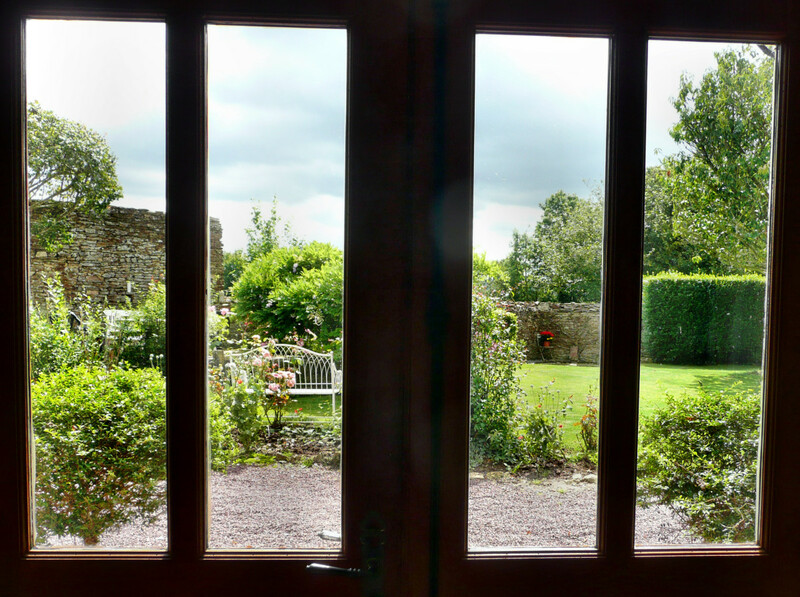 PS...the view of your gardens from the front door is quite spectacular! Truly picturesque!